Reflecting on the Camino more than a year after having my second experience of this magical and transformational journey. I have been re-reading messages from my fellow pilgrim companions – people I met and shared sometimes just a few moments and others a walk, a coffee – tea – beer or wine, or others a lunch or dinner – All were amazing connections sharing the spirit of the Camino and what it means to each person. Some reflections echo a similar theme and all have their own importance and extra special significance as this is a personal inner journey, as well as, an outer bonding among all who share in its beauty! It’s been over a month since we returned from Santiago to Lebanon, and we went straight back into the vibrant and extraordinarily busy daily life we lead here. Despite what you may be hearing on the news, we are all well, enjoying our summer from a tranquil apartment in the mountains close to extended family. Tony goes down to Beirut every day for work, and I luckily commute through the mountains to my office. While the general situation is not what we’d prefer, we are hopeful that it will improve. Assaad and Nadim have started their 10-day Scouts summer camp higher up in the mountains, and Nour will start hers on Friday, 7 September, their birthday. They turn 14, and none will be home to celebrate! They prefer we don’t show up to their camps (Please don’t come! ), as we have in previous years. But we do have a plan to drop an enormous jar of Nutella at each camp, big enough for 50 kids to share! 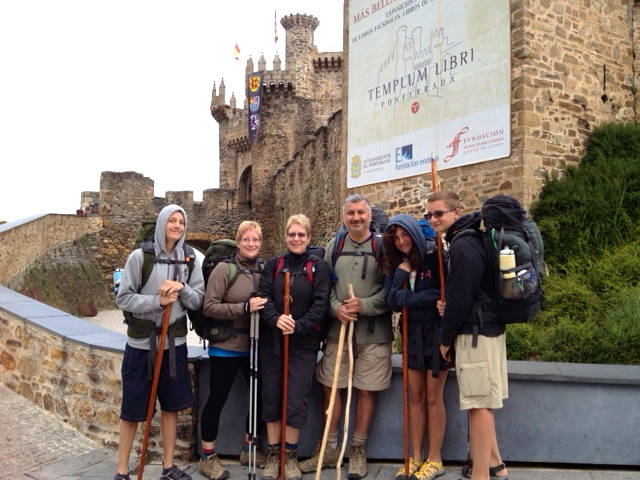 What a nice time the Camino was for us! We talk every day about our experience and appreciate it even more as each day passes. What a fantastic time we had! How blessed we are. We’re thankful for having met you and hope that, in the future, we can get a group to walk the Lebanon Mountain Trail. Next week, we’ll be meeting with some of the founders of the LMT to see how we can become involved. Yesterday, Tony also appeared on a television program to talk about our experience. When the video is on YouTube, we’ll send the link. This entry was posted in Camino Inspirations! and tagged architecture, camino, Camino Gratitude, Camino Stories, culture, Inspiration, nature, outdoors, The Way, traditions. Bookmark the permalink.